The NRC Nutrient Requirements of Poultry has been a benchmark publication for the research, judicial, and regulatory communities domestically and abroad since the first published edition in 1944. Revised edition of The Nutrient Requirements of Swine released Published July 16, 2012 URBANA – The National Academies of Science recently released the 11th Revised Edition of The Nutrient Requirements of Swine, also known as the Swine NRC. 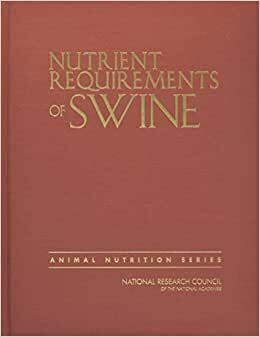 The National Academies of Science (NAS) has released the 11th Revised Edition of The Nutrient Requirements of Swine, also known as the Swine NRC. A committee of 10 swine nutritionists from universities and USDA's Agricultural Research Service (ARS), worked for 18 months to produce the new edition.